Domo Japanese Country Foods Restaurant -- Celebrate New Year's with Us! Domo will be open from 5:00 pm to Midnight on December 31st to bring in the New Year! Four distinct varieties of imported Japanese sake will be ON TAP, FREE with dinner orders. All entrees will be 10% off for this evening only! For reservations for parties over six call 303-595-3666. All parties need to have a valid ID. Everyone under 40 will be carded. A designated driver or taxi reservation is a MUST to share in Domo’s complimentary sake celebration. Domo Japanese Country Foods Restaurant would like to thank all of our customers for a busy and award winning year. Domo was honored to receive Westword’s Best Japanese Restaurant for the 12th consecutive year in 2008 and also received recognition in Zagat’s National Restaurant Review for 2008 as the #1 Japanese Restaurant in décor in the USA and included in the Top Japanese Restaurants in Colorado! To show our appreciation, Domo will be holding an Appreciation Celebration Sweepstakes from December 1st, 2008 to January 31st, 2009, and everyone who dines at Domo for dinner is qualified to fill out an entry card. *Great Prizes in Domo’s Celebration Sweepstakes!! Two Gold winners 50% off all lunch and dinners for 1 year! Ten Silver winners Three free dinners! Twenty Bronze winners Three free lunches! Thirty Boobie prize winners One free lunch! Domo’s Appreciation Celebration Sweepstakes will be held Dec 1st –Jan 31st 2009. Winners will be announced on Feb 5th, 2009 on the Domo Restaurant website at www.domorestaurant.com. Winners must call Domo to claim their prizes. Pork and beef shabu shabu for 10. 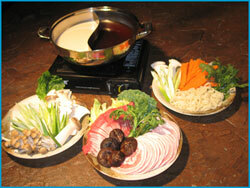 Shabu shabu is a Japanese variant of a hot pot dish. This dish is related to sukiyaki in style, where both use thinly sliced meat and vegetables cooked to your taste right at your table. However, it is starkly different in taste; shabu shabu is more savory and less sweet than sukiyaki. It is considered a winter dish but is eaten year-round. In Denver, only at Domo are these choices available! Every combination includes tofu, udon noodles, enoki mushrooms, shitake mushrooms, carrots, Japanese scallion, honey mushrooms, romaine lettuce and chrysanthemum leaves. and Domo’s original inari sushi! All together, $25.00 per person (not including tax and gratuity). 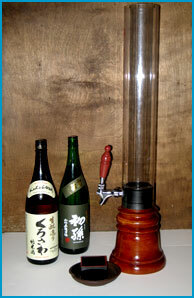 Also … Sake on Tap! Serve yourself! Domo has two different sake’s on tap for a little holiday cheer. Your party is charged for only for what you drink — by the inch! Click here to see a list of the selection of special Winter Teas. Make your reservations early, space is limited. Zagat's Top Japanese Restaurants in Colorado, #1 in the USA, #1 in décor 2008! Make your next get-together at Domo! A portion of proceeds from Domo are donated to humanitarian and cross-cultural projects in the US and around the world through Nippon Kan Culture Center's AHAN (the Aikido Humanitarian Active Network). For more information on Nippon Kan and AHAN, visit the website at www.nippon-kan.org. Monday–Saturday: 11:00 a.m. – 2:00 p.m. and 5:00 p.m.–10:00 p.m. Please email Domo Restaurant at info@domorestaurant.com if you would like to be removed from this mailing list.